Horses are athletic and graceful, and their beautiful nature makes them incredible companions. But owning one of these magnificent animals is hard work, and requires a huge amount of dedicated time and care. Read on for RSPCA NSW’s guide to looking after your horse. 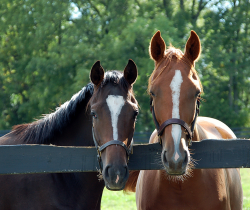 Healthy horses are alert, inquisitive and love interacting with other horses. From dental care to exercise, food to shelter, here’s how to ensure your majestic friend stays happy and well. Just remember: before adding a horse to your family, ensure you are confident and competent in handling them. This is really important, as horses can be dangerous when not handled appropriately, even when they don’t mean to be. Horses aged two to five years old need their teeth checked by a veterinarian or qualified equine dentist every six months. After the age of five years old (when they have their full set of permanent teeth), they need a dental check once a year. Some signs of dental problems can include irregular chewing patterns, excessive salivation, a swollen face or jaw, a reluctance to drink cold water and weight loss. 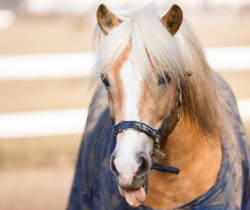 However, some horses show no outward signs at all, even if they are experiencing extremely discomfort, so don’t wait before contacting a veterinarian or equine dentist. For more information on dental care, including other signs of dental problems to look out for, click here. Horses need to be with other horses, as they naturally live in herds. 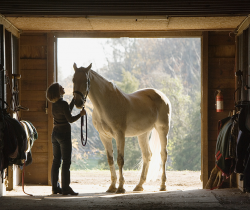 Ideally, your horse should always be able to see and touch another horse. Playing and running together is very important, however old they are. Horses also enjoying grooming each other. A horse can ‘bond’ with another type of animal if that is all that is available – even if that animal is a chicken or a cat. However, another horse is always the best companion by far. Please note that a human is not a substitute for another horse. Without companionship, horses easily become stressed, and may show signs such as losing weight, running around a lot and whinnying. For more information on why horses need other horses, click here. Grooming is an important part of routine horse care, and is good for your horse’s skin. Basic care involves brushing your horse’s body in the direction of his hair growth. This will remove mud and dust. You should also pick out his feet, and tidy his mane and tail with a brush. Grooming is also a good opportunity to check your horse for injuries. Click here to read more about grooming your horse. Horses need lots of exercise every day, and are naturally very active animals. In the wild, they’ll cover between 30 and 80 kilometres every day! However, they won’t just move for the sake of it unless they are grazing or being exercised. The best way to get your horse moving is to turn him out to graze with other horses. This is because pasture makes horses move. Read more about exercising your horse by clicking here. Horses are herbivores, they only eat plants. They need a lot of fibre in their diet, and feed that takes a long time to collect and chew. That’s because they don’t eat meals in the same way that we do. Instead, they need to graze and browse for at least 12 hours each day. Because of this, it’s better for them to eat lots of low energy, low calorie, fibrous food than a little high calorie food. Well-managed pasture with a diversity of species is the best feed. If there isn’t enough pasture, they’ll need lots of hay. 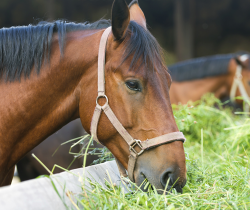 Never feed your horse lawn mower clippings or other garden waste. Unless they’re working hard e.g., eventing or racing, horses can easily become fat. If this does happen to your horse, it’s much better to reduce his calories and keep up the volume of food you feed him. Your horse also needs access to clean, fresh drinking water at all times. Click here to read more about what to feed your horse. Click here to read more about providing your horse with water. Your horse’s paddock should be at least one acre large, have adequate drainage, good grass cover and natural shelter. It should also be properly fenced (no barbed wire), and free from debris and rubbish, particularly old wire. The main parasites that can affect horses in Australia are bots, lice, ticks and worms. Bot eggs can be removed from your horse by clipping or scraping. Do this in a yard, but not where your horse grazes. You can also ask your veterinarian about worming products which contain boticides. If your horse has lice, a produce or saddlery store will be able to provide you with treatment. Even if just one of your horses has lice, you will need to treat all of them, plus rugs and saddle blankets. use an effective, broad spectrum anthelmintic (worming) paste. Speak to your veterinarian about which product would be best for your horse. For more information about bots, lice, ticks and worms, click here. Horses always need access to shade and shelter, whatever the weather and even if they have thick winter coats. Please note that horse rugs are not a suitable replacement for shelter. Vegetation in paddocks is a natural form of shelter, but can easily be eaten or trampled by your horse. Stables often get too hot in the summer, so should have a shaded outside yard attached. If you have several horses and provide them with a manmade shelter, the entire herd must be able to get into it comfortably, without getting trapped. Find out more about providing shade and shelter by clicking here. You can find the RSPCA horses looking for homes on Adoptapet.